This week Izzie and Ollie went back to school and preschool after half term (side note: I cannot believe it is Ollie’s last term at preschool!). I am a stay at home / work at home mum and I find it so hard to get organised – really, hats off to working mums, you actually deserve a medal – or at least a lot of wine/gin. Our morning routine is hectic, and loud and mad – we have to be out the door by 8.15am as Ollie’s preschool is in the next village along from Izzie’s school, and long story short it works out that I have to be in two places at the same time. Similarly once we pick Izzie up from school in the afternoon (Ollie gets picked up at 1pm), a whole different routine begins – play dates, homework, tea time, bath time and bedtime – somewhere in there we get to fit in playing, and maybe a bit of tv. This also doesn’t include days when Izzie has after school clubs. As you can see, our days are busy and with three little stinkers, I have to be super organised, because other wise I end up feeling overwhelmed – and then I end up being a shouty mum. This week also, Ell has been working much longer hours and so he hasn’t been around in the mornings – and last night the kids were in bed before he got home. Without blowing my own trumpet, I feel like I’ve kept on top of every thing and actually felt super organised – and I haven’t shouted hardly at all. 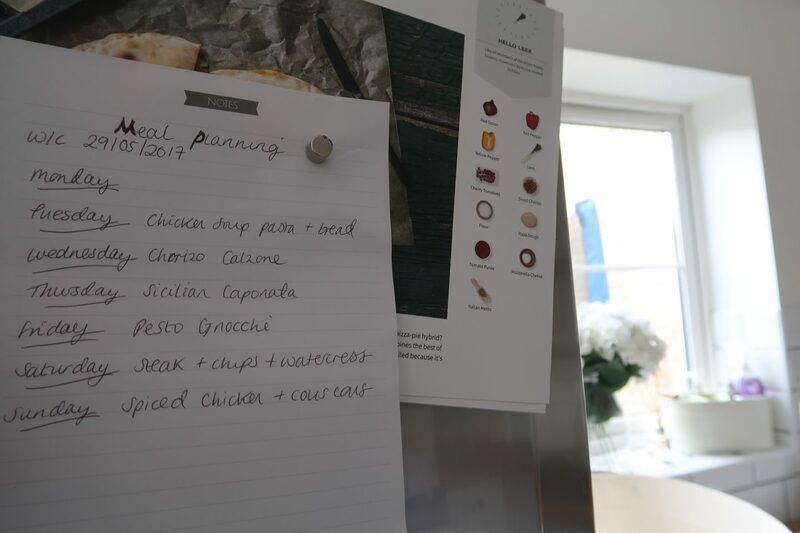 Meal Plan and do your food shopping online – I find this helps as I don’t have to end up rushing to Waitrose with three mad kids in tow trying to work out what’s for dinner. Also I know that everything needed for Ollie’s packed lunch is in the house! Make lists – I have a wide range of lists stored on my computer, from packing lists for holiday, to ideas for Ollie’s lunch so that he doesn’t eat the same old jam sandwiches every day! If I keep them saved, I can refer back to them and I find it really helpful. Also when I go to bed/wake up I make a quick to do list on my phone for the day – things such as paying bills or what loads of washing I want to do. Then I delete them as I go along. I keep a set of the kids toothbrushes and toothpaste, and also a box of hair ties and a hairbrush in the downstairs toilet – this means we avoid having to keep going up and down stairs to get ready in the morning. The kids can also help themselves if they want to. A basket by door for shoes and book bags – I had done this since Izzie started school. In the basket I keep all their bags, shoes and hand their coats above it – we have everything at a level they can reach, so they can hang up / get their own coats on – usually after being asked quite a few times. Even Mason who is 2 has got into doing this recently. Get organised the night before – I always make sure the kids clothes / uniforms are out for the day so they can get dressed when they get up. Saves me time – plus I know if we need a sweatshirt washing or some more clean socks. Have a shower and wash your hair before bed – this is more for me – although I admit I am the queen of dry shampoo and messy buns, if I do my hair and have a bath/shower in the evening, I can get an extra 20 minutes in bed – it’s purely selfish! 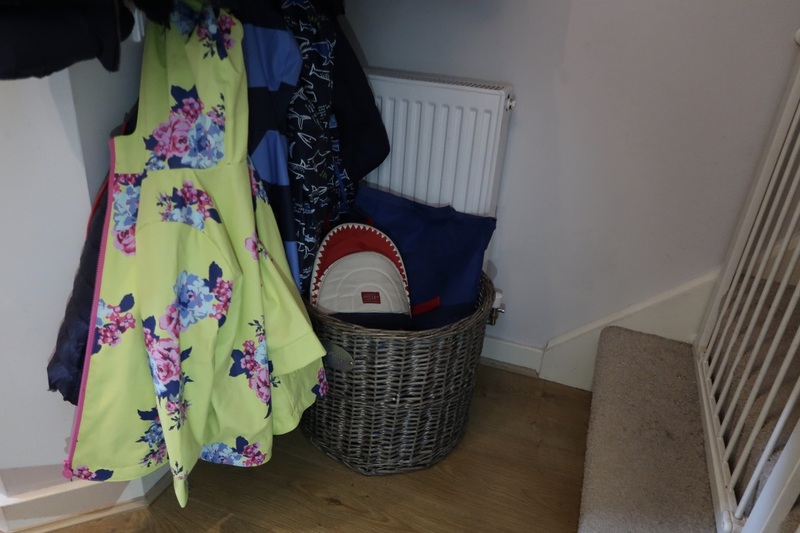 Spare car seat – we keep a spare booster seat in or under stairs cupboard ready for any play dates – or for if someone else is picking them up. Saves me having to lug around our heavy isofix ones. Set alarms – I don’t just mean for getting up in the morning. I use alarms for everything – to remind me to take things out of the freezer, even to remind me about that damn water bottle I always forget! Regularly check newsletters/school letters/ website and write it in your diary – I try and do this once a week – Izzie’s school don’t send things out too regularly but I like to know I’ve written it down and then I won’t forget. 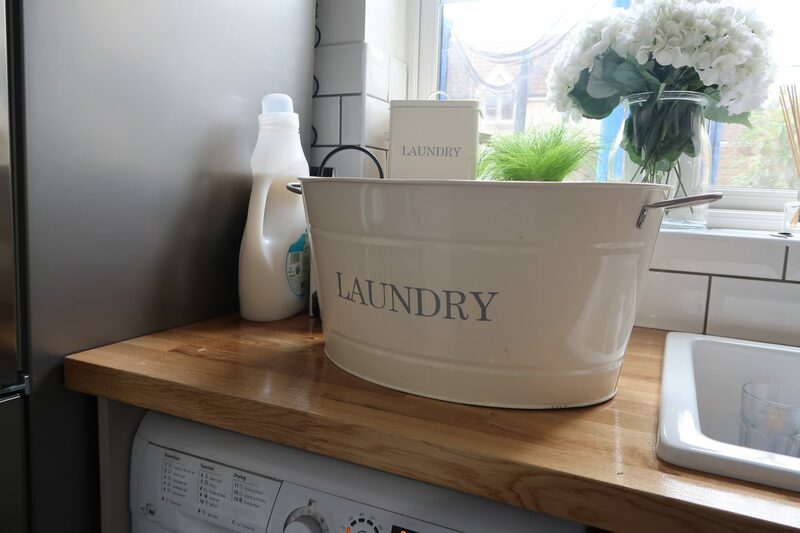 Have a schedule for washing – or aim to do at least a load a day – I used to have set days that I did certain loads – for example, towels on a Monday, but now I just make sure I do at least one load a day to keep the baskets from overflowing. 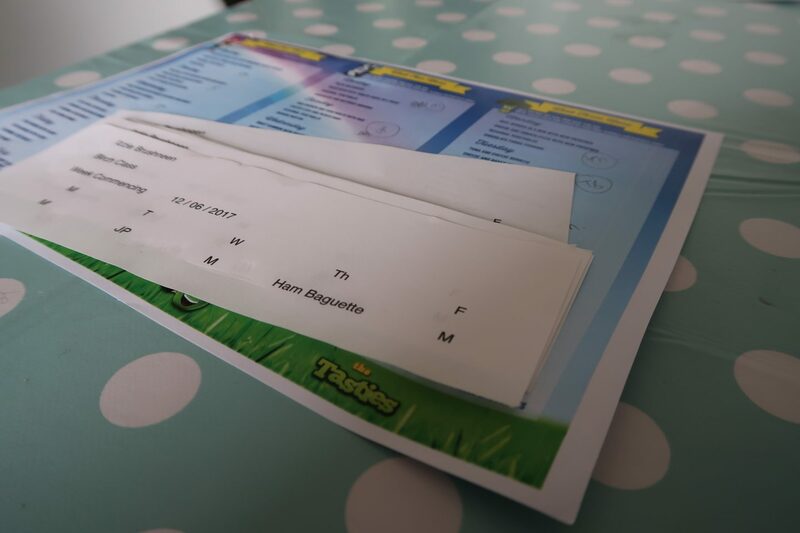 If your child has school dinners, pre print their lunch slips with their name and class and then you can just fill them in at the beginning of the week ready to go. Izzie’s school has a set menu per term, so in the holidays, I go through it with her and she chooses her meals – I think print them out and stick them on the fridge. It easy enough to cross it out and change it if she changes her mind about what she wants to eat, but it saes me so much time on a Monday morning. Clean little and often and tidy as you go – I am a huge fan of the speed cleaning videos on YouTube – I find them so satisfying to watch. I like to set a timer for 10 minutes and see how much I can get done in that time. Also small things like stacking the dishwasher after meals, and wiping round the surfaces/table, means the mess doesn’t build up. My Nan always said if you make your bed, you have a tidy bedroom, if you wash your dishes (or stack the dishwasher) you have a tidy kitchen. It’s true. She was a wise wise lady. So that’s my hacks and tips – I try as hard as I can to keep on top of them – although when we were recently having our kitchen done, it was a different story – I have never been so disorganised and I felt all out of sorts because of it. I hope this has been helpful too. I would love to hear if you have any hacks or tips to add – please leave me a comment if you do. Some goof ideas here. I also make the packed lunch for my boy before going to bed most nights (boy child goes to childminder as he is only 2). And I also put out and meds they may need so I don’t forget. When I am putting away school uniforms I pack one full set on each hanger (t shirt, tights dress) so that my 5 yo can go grap a full set herself. Have thought about starting doing the same for my boy as I always forget to bring down socks for him.